1531 - Henry Bestney sold to William Sharpe land called Tyghel, Dykes and Bushcroft. Henry Bestney had previously bought them from Thomas West. (see 1500 ). One of these properties may or may not have been the property previously known as Dixies. [ VCH Vol. 2, p.401 ] Bushcroft was probably in the area of what is now Beechtree Lane. December 5th 1539 - THE DISSOLUTION OF THE ABBEY OF ST. ALBANS. - The manor of Leverlestocke etc. was included under the rent of the customary tenants in Westwick. [ VCH Vol..2 p.400 ] The manor of Westwick also reverted to the crown. [ VCH, Vol. 2, p.394 ] That is to say that both manors of Westwick & Leverstock Green (Market Oak) had been under the jurisdiction of the Abbey at St. Albans, and that at the dissolution, the Crown became the Lord of the Manors until such time as they were sold on by Henry VIII. The Manors of Abbots Langley and Hemel Hempstead also reverted to the Crown upon the dissolution - Abbots Langley having been part of the lands belonging to the abbey at St. Albans, and Hemel being part of the lands of the BonnHommes at Ashridge. September 28th 1540 - Following the dissolution of the monasteries, Henry VIII sold the manor of Abbots Langley to Richard Lee, a military engineer, but sold the patronage and the remaining revenues of the living of St.Lawrence (Abbots Langley's church), along with the manor of Chambersbury, to William Ibgrave, of the Hertfordshire Commission of the peace. He was also the King's embroiderer.
" 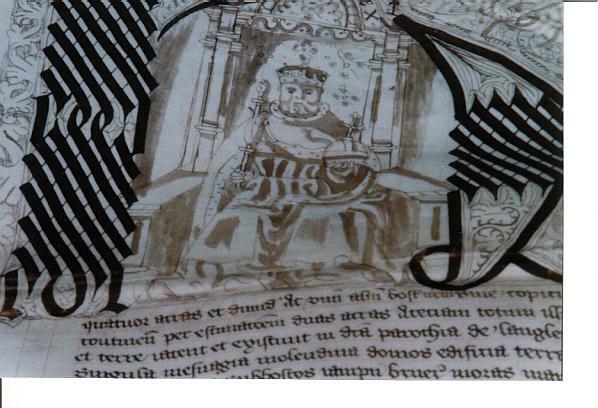 This bille made xxviiith daye of Septembre in the xxxiind yere of the reigne of our sovereigne Lorde kynge Henry the VIIIth wytnesseth that I Edward North esquire treasurer of the revenues of the augmentacions of our sayd Sovereigne Lorde the kyngs crowne have receyved of William Ibgrave of Langley Abbott in the countie of Herts esqyre the some of two hundreth pounds sterlyng in full contentacion and paymente of the some of four hundreth and three score poundes tenne shyllyngs and tenne pence sterlyng beyng dew unto the kynges highnes for the gyfte grannte and purchas of the rectorye or personage called Abbotts Langley with his rights and appertenances in the countie of Herts latelye belongyng and appertayniyng to the late monasterye of Saynte Albans in the sayd countie of Herts nowe dyssolved and for an yerelye pencion of twentie shyllyngs yerely goyng oute of the vycarage of the Langleye to the sayd rectorye or personage and for the advowson of the vycarage of Langley aforsayd and for one pece of lane conteynyng by estymacion three acres lyeng and beyng in Abbots langley aforsayd and for a water mylne called Nasshe mylle beyng upon the sayd landes and for all water courses and ryvers appertaynyng to the same mylne and for all that cotage called mylne house with the appertenances in Abbots Langley aforsayd lately belongyng to the sayd late monasterye whiche sayd some of two hundreth pounds sterlyng shalbe dew unto the kyngs majeestie at the fyrst daye of Octobre nexte ensueng the date herof as by recognysaunce in that behalfe made more playnlye dothe and may appere In Wytnes whereof I have sealled and subscribed this bille with my hande the daye and yeare above wrytten." 1556 - An Inquisition Post Mortem for this year, on the property of the late William Ibgrave, showed that Chambersbury Manor had a capital messuage called Jurdens, which had been lately rebuilt, and was inhabited by William Ibgrave. Reading the section in Scott Hastie's book concerning Abbots House [S239, p.40], together with HALS document 37788 concerning Jordens in 1629 and the information in the Victoria County History,[ Vol.2, p.326], it seems quite possible to me that the oldest surviving part of Abbots House, near St. Lawrence's Church in Abbots Langley, was in fact the rebuilt principle dwelling of the manor of Chambersbury, named Jurdens by William Ibgrave after his mother Joan Jurdeyn. The size of these various holdings varied considerably from less than 5 acres, to 546 acres. It is also worth noting that one person's holdings weren't necessarily all together in one conveniently neat unit, but that different parcels of land could be held by one individual in a variety of locations, rather like players in a game of Monopoly holding the title deeds to properties at different locations around the board, with sometime more than one player owning the properties blocked together under one colour. It would be possible to list all the various parcels of land, their various owners and the relative positions of them, where they come within our study area. To do this in entirety is, I feel unnecessary. I have, however, covered much of the survey in detail as it is one of the earliest such detailed accounts of our area. Should the reader wish to get a more overall picture they should refer to the original document at the Hertfordshire Record Office. Despite it's great age the survey is very easy to read. The present day Dell Cottage is in the right possition and would appear to have been the tenement in question. I am unclear as to whether there were in fact two detached properties, or a semi-detached building. I now feel sure that one of these two messuages was what we now call Westwick Cottage, and that the land surrounding two properties were adjacent to one another. This is why what we now know to have been a high status dwelling in the 12th century, apparantly didn't exist for th e1569 survey, and yet survived in tact to the present day! Of his father's land, Henry Dell now held: The Croftes Behind the House, Netherhomefeild, Stocking Crofte, and two parcells of land in Laydene. Edward Birchmore held the copy hold of the following, "in right of his wife": Upper Homefeild, Middlefeildes, Overfeilde and four parcells of land in Laydene. They also seemed to have a moety (that is a half share) of the Grove. The entries for Henry Dell and Edwarde Birchmore reveal yet another small lane - Stockingecrofte Lane, which was to the south of the parcell of land known as Stocking Crofte. The copyholder of two small parcells of land next to Twichell Lane (Pancake Lane) was Raufe Longe. This land had previously belonged to Thomas Howes, who by 1569 was deceased, and had also at sometime been in the possession of Peter Griggs. These two fields were called Overfeilde amd Homefield. Both were bounded on the east by Twichell Lane and to the West by New Mill Crofte. Overfeilde reached down as far as the village, it being abutted to the south by "Laverstowe Green". Homefield was immediately to the north of Overfeild. "One other close of lande called Grovefeild with a little spring 2 in it abutting eastward on a Close of one Ibgrave's called Little Rudding and a Commen feild called Blackrudding and Westward on Twichell Lane and Northward on Plychell Crofte and southwarde on West Crofte." "One other tenement or cotage with yardes orcharde and close therunto adjoininge called Netherhouse Close abutting eastwards on Comon Woodfeild late Whites and abutting westwards on Westwick Rowe and northwards on Blakes Feilde and Southwards uppon Westwick Rowe aforesaid." Other land obtained from his wife on their marriage included New Mill Croftes, which were three fields running down Green Lane towards Stonards, and covering much of the land occupied by Leverstock Green School today; Mynettes, which bordered the very top end of Green Lane and which today would have been part of the Buncefield Depot, (see Map of Medieval Field names); Nokefeilde, Ivrings (or possibly Lurings, it was difficult to decipher), Littell Blakefeilde, Hasell Dell and a pece of Laydene. All these fields were in the region of Breakspears and Megdells. Breakspears itself was owned by Edmond Carpenter, who like William Ewer had obtained it through marriage. Along with the house of Breakspears were several fields in its vicinity: Durynges, Pondcrofte, Northfield and Peazcroftes, Furrows, Brodfeilde, Blakesfeilds, Long Furlonge, Snotbeche,and Marlecrofte. He also had three parcells of land in Laydene. The exact size of the holding was obviously in doubt as a memo stated that an inquiry had to be made into it. A third bay was added to the house now called Hill End Farm. 31st October 1591 - "John the sonne of William Feilde of Bennetsend" - was Baptised at St. Mary's Church Hemel Hempstead. 13th April 1594 - "William the sonne of William Longe of Bennetsend" was Baptised at St. Mary's Church Hemel Hempstead. 24th April 1594 - The following Feoffes were appointed by Indenture to the Boxmoor Trust and known to be resident in the Leverstock Green area. Others on the list may also have had connections with the area, by owning the odd parcel of land, but I have not included them here unless like Richard Birchemore, they owned a considerable number of plots of land. · Edmund and Roger Partridge of Tile Kiln. Roger was also Bailiff of Hemel Hempstead in 1628. Photographs of the initial letter of HALS doc. 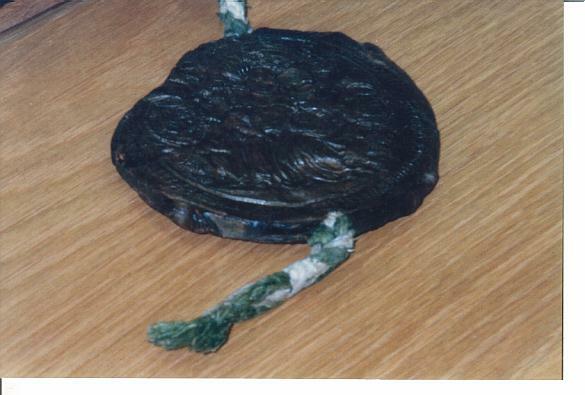 80911, together with its Geat Seal, are reproduced here with the kind permission of Hertfordshire Archive and Local Studies.